Not only do the former members of Guns N' Roses not get along, Axl Rose even hates the cartoon version of Slash that appears in Guitar Hero III. 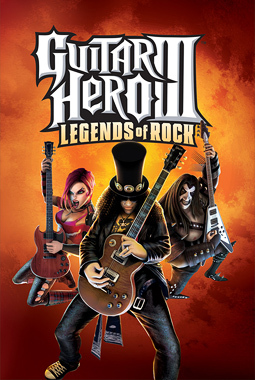 Axl sued Activision this week, claiming that it had fraudulently induced him to authorize the use of "Welcome to the Jungle" in Guitar Hero III by promising him that the game would not include Slash or his band Velvet Revolver. It would probably take a team of rock lawyers to untangle the rights issues involved, and I'm certainly not going to try to do it here, but Axl at least claims to have the rights to "Welcome to the Jungle" and says he would never have authorized its use had he known "an animated depiction of Slash" or songs by Velvet Revolver would also appear in the game. According to the Wikipedia page devoted to Axl Rose's feuds and rivalries, Axl really has not gotten along too well with other rockers. (In other news, there is a Wikipedia page devoted to Axl Rose's feuds and rivalries.) He supposedly once called Scott Weiland (Stone Temple Pilots, Velvet Revolver) a "fraud," among other insults, which led Weiland to call Rose a "frightened little man who once thought he was king" and who had an "unoriginal, uncreative little mind." (Two years later, Weiland apparently could not really remember what that was all about, which I guess is not that surprising.) Rose has also said that he considers Slash "a cancer, better removed and avoided," so it appears there is still some work to be done in repairing that relationship. Rose is demanding $20 million in damages he says he suffered due to Activision's alleged "web of lies and deception."